Commissario Guido Brunetti is woken early one morning and summoned to the scene of a mysterious death; the body of a young man has been found floating in a canal, apparently dead from a severe stab wound. The victim is soon identified as an American public health inspector based at a military base in Vicenza but Brunetti’s boss is reluctant to let the Commissario travel to the base to make enquiries; he would rather ascribe the death to a drugs related crime because he fears that to do otherwise might have implications for the tourist industry in Venice. “Death in a Strange Country” is the second of Donna Leon’s novels set in Venice and centred on the charming Guido Brunetti. The novels had been recommended by a fellow amateur reviewer but I was unable to get my hands on “Death at la Fenice” the first novel as quickly as I wanted so I opened this one right away. It’s really not necessary – at least it appears that way from this book – to read the books in sequence. Certainly this book did not make any references to its predecessor that were obvious to me. The reader learns a little about Brunetti and his family and I suspect that over the next books some of this will be repeated; maybe four or five books in I will find this frustrating but I felt that in this novel there was just the right amount of introduction to the character and his family. Given the nature of Italian politics and public life, I suspect that the series of books will be popular with new readers time after time; basically unless things change substantially they will remain relevant and reflective of Italian life. 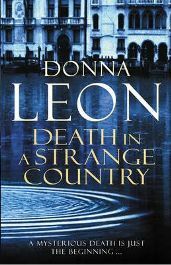 Donna Leon is in a somewhat fortunate position as an outsider commenting on Italy and while it is obvious she loves her adopted home country, she takes the opportunity to highlight the corruption that ensures that government, business and the legal system pretty much have carte blanche to behave as they please and keep their business secret. Other than Guido and his immediate family there wasn’t much in the way of characterisation to dwell upon. The minor characters were credible enough but didn’t play much of a role overall. The real strength was the story which trotted along at a reasonable pace, allowing the reader time to digest the events and make some conclusions along the way. For armchair sleuths there is just enough to get your teeth into though the ending proves a little unsatisfactory and possibly suggests that this kind of ending may be something we can expect from any future investigations conducted by Commissario Brunetti. The star of the show, though, is the city of Venice and I am certain that this series of books will do much to entice visitors. Donna Leon’s depiction of the city is not restricted to a physical description of Venice but also includes interesting references to the city’s history and the general lifestyle and customs of Venetians, often in comparison with people from other parts of Italy. I liked Donna Leon’s easy style of writing and found I was able to zip through “Death in a Strange Country” over a couple of days but I think that the subsequent novels in the series may prove to be too similar and less satisfying. I do, intend, however, to read at least a few more (there are ten more teetering on my dining table) because I found Brunetti a likeable and interesting character and one I haven’t quite finished with yet. No Comments on "Death in a Strange Country"